3D pokies have brought a whole new dimension to online casino gaming due to their immersive ambience and intricate attention to detail. 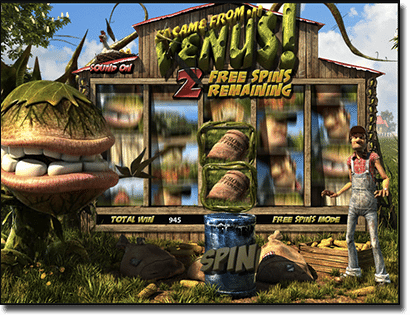 Software developer BetSoft has pioneered the emergence of 3D slots with their line Slots3 and one of their main stars includes It Came From Venus. The theme is quite unusual but before we had even started spinning the reels, we knew we were in for a solid gaming experience. It Came From Venus by BetSoft features 30 paylines across 5 reels and is set on a farm owned by Skeeter, which has been hit by an alien flytrap, named Butch, sent from Venus. In order to win players need to help Skeeter evade the army which has come for Butch in order to dissect it and while the story is quite unique and somewhat comical, the graphics are done so well we can’t really question why a flytrap would come from Venus. Even the soundtrack is equipped with sound effects you’d expect to find on a farm, as well from Skeeter himself, and a banjo playing in the background. Annoying for some, but don’t worry, it’s easily muted in the top left hand corner of the slot. What we love about BetSoft is they know how to create an original theme and execute it perfectly via the symbols. Instead of just throwing in the traditional A to J symbols, they make every single symbol tie in with the theme. The lower paying symbols include the farm tools, the barn, and Butch’s home, while the middle value symbols include the dirt, the tractor, the scarecrow,and the Lieutenant. Skeeter pays the most as a standard symbol payout with five symbols scoring you 1250 coins, while landing five Butch (flytrap) symbols will score you the progressive jackpot. Scatter symbol: The scatter symbol is the ‘Do Not Trespass’ symbol and is the highest paying symbol (depending on the size of the progressive and the size of your bet), with five scoring you 3125 coins. The Scatter does not activate any Bonus or Free Spins features. Wild symbol: The Wild symbol features the text ‘Wild’ and a random multiplier attached. It substitutes for the Bonus Symbol, the Free Spins symbol, and the Scatter symbol, and when it completes a winning payline the random multiplier is applied. Bonus symbol: The Bonus symbol is the Helicopter and by spinning three on reels 1, 3, and 5 you will activate the Save The Plant Click Me feature. Free Spins symbol: As mentioned above the Scatter does not activate the Free spins round, rather BetSoft have chosen to include another symbol, which is the food sack. You need to collect five by landing the symbols on the middle reel to activate this feature. As you can tell from the number of extra symbols included there are a number of bonus features to this slot. Land three helicopters on reels 1, 3, and 5 and you will activate this bonus feature where you can click crates to reveal cash prizes. This bonus continues until you find Butch in one of the crates. The Free Spins bonus isn’t activated the usual way (via Scatters) here. Instead, it is activated by collecting food sacks, which is done by spinning the symbol anywhere on the middle reel. Once you have collected five food sacks you will trigger 12 free spins. The food sack will then become a Sticky Wild where multiple sacks may be locked into place for huge wins. If you manage to spin three of the same symbols these will collapse and you will win a three symbol payout, while new symbols will fall into their place for another chance at a win. The Double Up feature is a themed version of the gamble feature where you can double your money, or lose it all. You can opt in for the Double Up feature on any win and here you can guess whether the plant will catch or miss the apple. If you are correct you will see your winnings doubled, but answer incorrectly and you will lose your winnings. There is a small progressive jackpot, generally in the four to five figures range, attached and you can win this by landing five Butch symbols. As with many of BetSoft’s slots, It Came From Venus has been made compatible with mobile devices – including Apple, Windows, Android, and other devices. Since we have experienced the cinematic 3D slots from BetSoft before, we had high hopes for this pokie and we weren’t disappointed. The graphics are so well done it makes for an enjoyable gaming experience before even factoring in the additional features. While it took us a bit to understand that the Scatter symbol does absolutely nothing other than land you a big payout if you spin five, once we figured out we needed to collect food sacks instead we found this to be a more interesting way to trigger the Free Spins Bonus. While it took us a while to trigger the Free Spins feature and the Click Me bonus, the random multiplier attached to Wild Wins kept us interested while the Stacked Collapsing Wins kept our bank balance topped up. We risked it once or twice with the Double Feature, but we don’t recommend doing it as it is quite risky. You’ll find It Came From Venus at www.HouseOfJack.com, a great online casino for players who enjoy regular promotions, including the new player bonus of $450 in matched deposits.